I’m not one to normally journey into a church in pursuit of a photograph however, I read that this is one of the few churches that allows photography (with professional gear) and are supportive of tripods, depending upon the number of visitors present. As usual, no flash is allowed (flash can damage the artwork). After figuring out the location and dealing with a cranky First Mate on the Water Bus, I arrived to find a very welcoming doorman who was very interested in my equipment and took extra time to point out a few things that he thought I should photograph. What a gem of a guy. 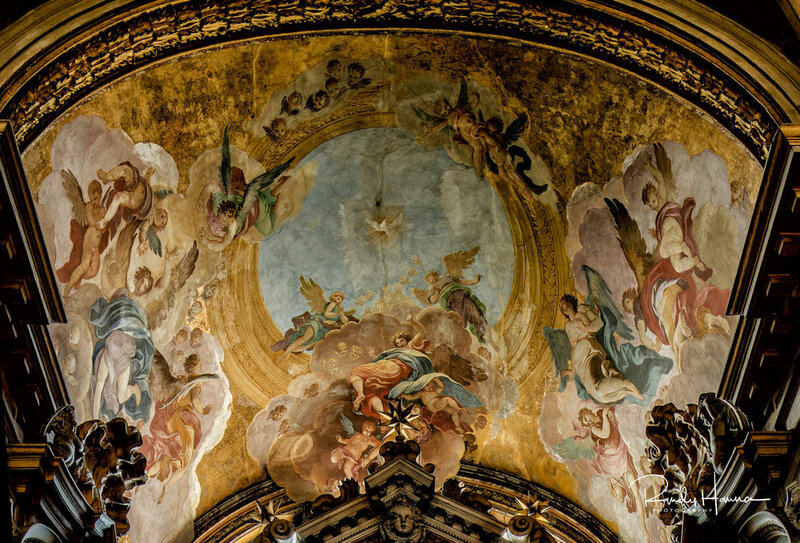 The church was designed by the architect Baldassarre Longhena and is one of the most remarkable examples of Baroque style architecture in Venice. The original construction of the complex ended in 1680. During the 18th century, a cooperative of artists enriched the church with various works of art. The Shine of the Holy Family was designed by friar Pozzo. This shine contains the Sacred Family group sculpted by Meyring underneath the vault painted by Dorigny. The image above is an extract of the vault or ceiling painting of this area. From my point of view as a photographer, I am mesmerized by the techniques of the early painters who can paint on a flat surface (curved in this case), and yet when viewed, the painting comes alive in three dimensions. The Presbytery, also designed by friar Pozzo features a high alter and Solomonic columns to sustain a pyramid tympanum that holds the effigy of The Redeemer. The dome, only partly visible in my photograph below, was painted by the Valeriani brothers. I was so overcome by the artwork and the incredible detail, that I failed to look up. Thus, I missed one important part, the Vault of the Nave. The fresco painted by Tiepolo in 1770 was destroyed by a bomb in 1915. The current ceiling is a huge canvas painted by Ettore Tito in 1941 and shows the proclamation of Mary Mother of God at the Council of Ephesus. Yes, I will return to photograph this next year, and with a Tilt-Shift adapter. All images taken with a Hasselblad H6D50C, HCD 24mm lens.